Open the door to ruins of the ancient civilizations and spend fabulous vacations among the Pharaohs’ remnants. And as we always seek for your joy, “Egypt Tours 2019” offer an extraordinary variety of Egypt tours 2019 to cover all the ultimate historical attractions in Egypt, and also Nile Cruises 2019 provides incredible chances to admire the glorious treasures of the Nile Valley on board the magical Nile cruise. Our Egypt holidays 2019 are planned to suit all types of Egypt visitors, large groups, small groups, holidays with the family, and also for couples on Honeymoon. “Egypt Holidays 2019” is your passport to relaxation and opulence. What Should You Know Before Visiting Egypt - Egypt Travel Tips Since the word vacation was invented, Egypt has always been the destination to be for tranquility, peace, and entertainment. So if you found yourself in Egypt then here are a few travel tips to make sure you have the perfect vacation: If you decide to do a tour by yourself, we highly recommend you take a note of main info like hotel name, exact address, and phone number. It’s advisable to Wear comfort shoes during your visits because heels and open toe shoes will not comfortable for you as the floor of most sites is either sand or rough stone floors. The best time to travel to Egypt is during the winter from September to April as the atmosphere becomes a bit tropical, a warm weather with a winter breeze. If you visit Egypt in summer take plenty of water with you during your tours because it’s usually hot, and you will need to drink a lot of water to avoid dehydration. Sunblock, hats, scarfs, and sunglasses, plus light clothes are recommended during summer time. Comfortable footwear like a closed toe shoe is a good choice. Egypt is considered to be one of the most liberal Islamic countries but it has become a little bit conservative in the last couple of decades so it is advised to avoid showing your chest, shoulders or legs below the knees. If you decided to get inside one of the pyramids, wear trousers (or jeans) because You will descend ladders and walk through narrow passages. When you visit the Egyptian Museum, it’s highly recommended to have a tour guide because most statues and monuments do not have a label guide to know about the monument, so your tour guide will provide you with all information you want to know about the Egyptian Museum. The food is good, and frequently safe. Mulukhiya, Shawerma, and Kushari are the most famous delicious food, you should try them. Plus make sure to stay hydrated at all times. It’s good for you to buy a local SIM card for your mobile phone. This will help you make calls to your hotel or travel agency or your guide, there are no prepaid phones or prepaid cards to make your call and a universal charger will be quite essential and quite useful during your holiday in Egypt. During your Egypt tours, it would be very useful known some word and phrases like Salaam Alaykum (hello), Ma'is Salaama (goodbye), min fudlak (please) for male and min fadlik for female, Shukran (thank you), lu samaht (excuse me), Aiwa (yes), laa (no), Yalla (lets go), mashy (okay), Afwan (you're welcome), Em'shee (go away) Tipping in Egypt Is Called ‘Baksheesh’ And Is Expected From Locals And Foreigners Alike. 5 Egyptian Pounds For A Small Service, Such As Carrying Bags, Is Fine and, 10% In Restaurants Is Acceptable. Always expect to bargain when buying souvenirs, but remember to maintain a polite friendly attitude to get the best prices. In most cases, the original price is 50% less than the initial price so make sure you don't get hustled. It is not advisable to drink the tap water because it is highly chlorinated and tastes terrible so buy bottled water instead. And when it comes to food don’t even think about buying any street food Visitors to Egypt do not require any vaccinations officially unless you are coming from infected areas so we recommend getting against typhoid, Hepatitis A and B, and rabies. Friday and Saturday are the official holidays in Egypt and most Arab countries so keep in mind that you could expect a large crowd at your tourist attractions. Check our Egypt tour packages and book your dream vacation which is customized to fit all your interests with affordable prices. The Singing Statues or the Vocal Memnon Colossi of Memnon are two massive monumental stone statues of Pharaoh Amenhotep III (1386-1353 BCE) from the 18th Dynasty of ancient Egypt. They depict the seated king on a throne ornamented with imagery of his mother, his wife, the god Hapy, and other symbolic engravings. They are made of quartzite stones, which were quarried at el-Gabal el-Ahmar since 1350 B.C. They were built as guardians for Amenhotep’s mortuary complex. This large complex was destroyed and turned out to be ruined because of the earthquakes and floods in Egypt. The Description of Colossi of Memnon They are 18 meters high and each one of them weighs 720 tonnes. They are carved from single blocks of sandstone. They are two-seated king statues on a throne ornamented, representing the pharaoh wearing the royal headdress of the Nemes, protected by the divine cobra. The hands of the king are resting on his knees and he directs his face towards the eastwards toward the Nile River. There are two small figures carved into the front part of the statues that represent his wife Tiye and mother Mutemwiy. The two statues are quietly damaged but they remain as symbols for the amazing Egyptian Civilization and culture. The Location of the Colossi of Memnon They are located west of the Egyptian city, Luxor in Theban Necropolis, which is Colossi of Memnon one of the most important Luxor tourist attractions, that can't be missed during your Egypt tours. The two statues are located about half a kilometer east of the Antiquities Inspectorate (the ticket office) on the main road leading to the west bank monument area. Amenhotep III and the Glory of Egypt The pharaoh Amenhotep III lived during the period of the New Kingdom from 1570 until 1069 B.C in which Egypt became a country of international power and wealth. His father left him a stable empire while being only twelve years old. He married Tiye, who was given the title “Great Royal Wife”. This title wasn’t even given to Amenhotep’s mother, which reflect the greatness of Pharaoh Amenhotep and his wife Tiye as married couples. He had a splendid vision of the land that can be witnessed through the 250 buildings, temples, steles, and statuaries that he built during his wonderful reign period. One of his mesmerizing palaces is the palace at Malkata that is located on the west bank of the Nile near Thebes. This astonishing place contains many rooms, a festival hall, gardens, a lot of libraries, kitchens, conference rooms, and Amun Temple. The Grand Mortuary Complex The Mortuary complex built by Amenhotep III was the largest and the biggest building that has ever been built in Egypt. It was even more inspiring than Karnak Temple. It included numerous rooms, halls, and plateaus, which mirrored the vision of the Field of Reeds, the Egyptian paradise. Very little remains today of Amenhotep’s temple. It turned into ruins after the disastrous earthquakes and floods in Egypt. Colossi of Memnon symbolize the rule of the king over Egypt. The three figures in the statues, Amenhotep III, his wife Tiye, and his mother Mutemwiya are all symbols of rebirth. They have withstood all the natural disasters that they faced. The Greek Mythology About Colossi of Memnon According to the great Greek Mythology, Memnon, who is the mortal son of Eos, the goddess of Dawn, was slain by Achilles. The two statues were also believed to be singing statues probably because an earthquake shattered the upper part of them, which cause noise every day at dawn from the statues. Many theories have been said about the mystery of the sound of the two statues and till today, it remains a confusing and a mysterious matter. Who is Memnon! Memnon was a hero of the Trojan war. He was also the Ethiopian king who led his armies from Africa towards Asia to defend the beleaguered city. At the end, he was slain by Achilles. The two statues generally refer to the entire Theban Necropolis as the “Memnonium”; the name that is popular for more than 2000 years. Things you can see at Colossi of Memnon Twins statues that depict Amenhotep in a seated position. Two shorter figures that depict Tiye, Amenhotep’s wife, and Mutemwiya, Amenhotep’s mother. While being in Luxor, you definitely have to visit the remarkable Colossi of Memnon to be able to see the greatness of the Ancients through our Egypt tour packages or Nile cruises presented by “Egypt Tours Portal”. El Gouna The city of El Gouna is one of Egypt's finest resorts as its part of the Red Sea Riviera and 20 km (12 mi) north of Hurghada. 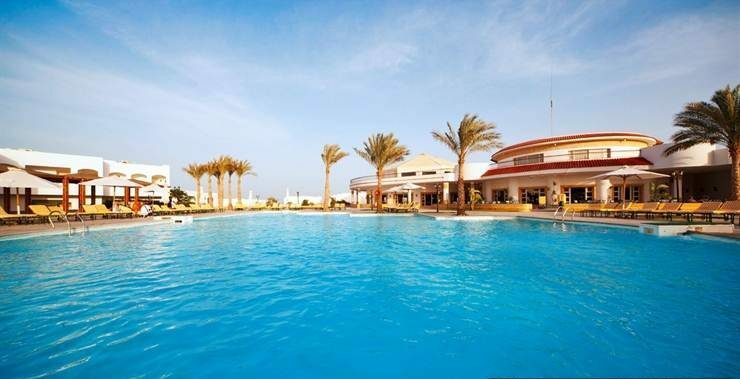 It was created in 1989 to become of the Red Sea magical resorts. The weather in sunny all year long with a temperature ranging from 17 C(63 F) to 33 C (91 F) the city it is famous for specializing in water sports like diving, snorkeling, kite & windsurfing and many others. El Gouna also contains a number of beaches like Zeytuna, Mangroovy, and Moods beach, more than 18 hotels, three huge marinas, and two massive golf courses. It also holds a small aquarium and many sports centers for football, tennis, squash, volleyball, horse riding and many others. The city is also equipped with a highly advance hospital to handle any medical treatment, a small private airport for charter aircraft and a small museum with 90 exhibits of modern Egyptian art. El Gouna is any travels dream as if you were looking for pure tranquility and an absolute sense of adventure then this city is where you need to be and check our best Egypt tour packages to choose your trip. and if you are already in El Gouna and want to behold the most famous destinations of Egypt, then you can visit our El Gouna excursions and choose the most suitable tour is for you. The Battle of Megiddo The battle of Megiddo is the first battle to be recorded in full detail in ancient history, as it was a custom for the chief military scribe “Tjaneni” to inscribe all the records of the battle in hieroglyphs on the temple of Amen-Ra in Thebes, Karnak. In approximately 1479 B.C, on the 21st day of the first month of the third year of the rule of king ThutmoseIII, pharaoh of Egypt led his army to fight off a revolt led by the king of Kadesh (the Ancient city in the Near East). King Thutmose III took the throne from his step-mother Queen Hatshepsut who was able to build a prosperous country and a very powerful, well- trained an organized army and pass it on to him when she died. After her death, the kings of Megiddo and Kadesh rebelled against him as they believed, he was unworthy and weak. 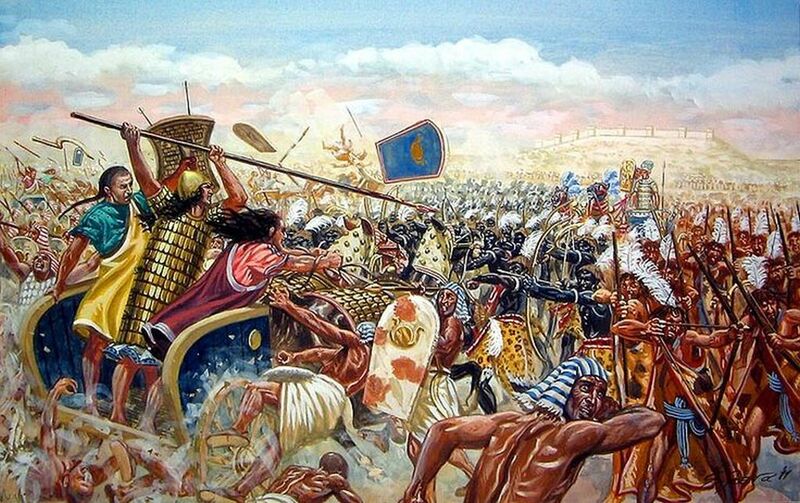 So king Thutmose first campaign was against the coalition between the Canaanites of Megiddo, the Syrians of Kadesh and other cities that took part in this revolt who gathered outside the city of Megiddo which was a crucial fortress and along an important trade and military route. He gathered an army between 10,000 and 20,000 men consisting of charioteers and infantry, the army took a base near the enemy forces, then he led his army through the dangerous path to the enemy’s base which gave him control over the element of surprise which caused the enemy’s army which consists of the same number of troops and weaponry to panic and also the pharaoh’s army access to very advanced weaponry and intelligence tactics. The Egyptian army chased the fleeing enemy’s and cut them down one by one, the remaining part of the army took shelter in the city of Megiddo. The battle turned into a siege in a matter of moments as the Egyptian army dug a most and made their own defensive wall all around the city. The siege lasted for seven months before the defeated leaders surrendered the city then the Egyptian army entered and took more than 20,000 horses, millions of grains and livestock, gold and silver chariots, jewels and precious metals and three fortresses. His victory gave him control of the northern front of his kingdom where he can launch campaigns to other countries and expand is the kingdom. The children of the defeated leaders were taken to Egypt, educated in Egyptian school and later when they come of age, they will return back to their land with the permission of the Egyptian pharaoh to continue serving him. His triumph over this coalition and through his time and unbelievable fame of this battle established the success of all his future campaigns and his reputation in the history books. Make your dream come true and discover the Egyptian mythology, battles, civilization, history, and many more by visiting the majestic temple and archaeological sites of Egypt, so check our breathtaking Egypt tour packages, or Egypt Nile cruises and choose your dream vacation. 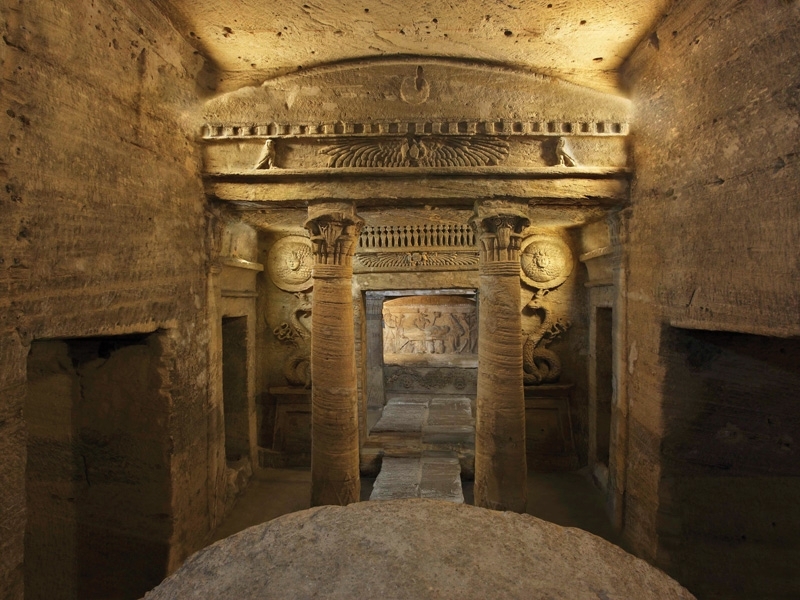 The Catacombs of Kom El Shuqqafa: The Catacombs of Kom El Shuqqafa is the most important tomb in Alexandria is located in the east of Alexandria. The Catacombs was found on 28 September 1900 by luck by a donkey fall into an excavation at the depth of 12 meters Subsequently the archaeologist has found Catacomb perchance although prospecting operations had started in 1892, it was for a rich family then it used for burying a lot of families after Group of welders rolled it. The Configuration of the Building: The Catacombs of Kom El Shuqqafa consists of 4 stories and inner Spiral staircase around a cylindrical hole and 6-meter diameter and 10-meter depth. The lower stairs are higher than the upper ones and the secret of this as we know in Roman buildings that the person who climbs up the stairs after visiting the deceased become more active. As if he does not climb up but walk a low spiral road to achieve comfort for the visitor. While the light of the stairs was from rectangular holes in the wall of the stairs. The entrance for the first floor by a vestibule then the rounded hall of the bodies of the dead is on the front of you and it has a dome held on six pillars and it leads to some small rooms. beside the rounded hall, there is the TRICLINIUM hall square shape with three terraces. The visitor of the dead meets to eating food in the feasts and special events. In the second floor, there is a rostrum you can see the burry room through it. The Catacombs can contain more than 300 corpses. The pillar and the walls show Egyptian, Roman, and Greek iconography. And the inner walls show an icon of 'Anubis' the Egyptian God of the dead. There are four corridors lead to a small group of tombs. one of these corridors gives access to an entirely different complex which joined to Kom Ash Shuqqafa, which it predates. most of the walls are not decorated, almost all paintings have faded. You can visit this historical place and enjoy an unforgettable time in Egypt by booking breathtaking Egypt tour packages to cover all Egypt famous landmarks. Where is Karnak Temple Located? Karnak temple is the largest temple in the world and the largest religious building ever made. It is located at "Thebes" Luxor city. karnak temple known as the temple of Amun, it was called Ipet-isu or "The most select of places" in middle kingdom, also know as Pr-Imn or "House of Amon" and it dates back to 2055 BC to around 100 AD, it built over 2000 years. What is the Temple consists of Karnak temple consists of a group of temples, largest space of them and the center of the temple it covers sixty-one acres belong to Amun-Ra, the male god of Thebes, we can see in the south of the central area his wife the goddess Mut. And more other temples like the temple of khonso, the temple of Ptah, the Ipt temple, the temple of Osiris and temple of Month. Karnak temple wasn't only for gods but also the Egyptian rulers who wish to be memorized added their own architectural mark to it over the centuries, from the beginning of the Old Kingdom, Middle Kingdom, New Kingdom and Ptolemaic Dynasty. First Pylon:- An avenue of ram-headed Sphinxes leads to the first pylon. Ram head symbolizing to god Amun, there are 20 rams on each side, it was built to protect the temple. The first Pylon is the main entrance to the temple and last building at Karnak. Great Court:- Great Court is 100m in length and 80m in wide it contains ten papyrus columns every column is 21m in height. Now only one column still stand is known as a kiosk of Taharqa who was the fourth king of the 25 Dynasty. There is the statue of Ramesses II it shows the king stand to wear the double crown of upper and lower Egypt, at his feet we found his wife princes. The Great Hypostyle Hall:- The Great Hypostyle Hall is the most amazing building at Karnak. It 103m in length and 52m in width, it consists of 134 gigantic stone columns, there are largest 12 columns are 24m in height and 3.5m in diameter, other 122 columns are 12m in height. It built by King Seti who ruled from 1290 to 1279 B.C. The outer walls of northern wing describe Seti's battle. The south wall inscribed with Ramesses II’s peace treaty with the Hittites. Sacred Lake:- A 120m by 77m Karnak Temple Secret Lake make it the largest of it's kind. King Tuthmosis III(1473-1458 B.C) dug it. It was used by priests for purification and other rituals like navigation, it was the home of sacred geese of Amun. It lined with stone and provided with stairways descending into the water. We can find the storerooms and home of priests surrounded the lake. Karnak Temple is one of the most important attractions in Egypt, where is a lot of tourists around the world come to visit it, so if you prefer to visit this historical monument and the other archaeological sites in Egypt you can check our luxury Egypt tours and choose your journey to Egypt, or other option you can enjoy it's Nile cruise tour between Luxor and Aswan which is the most adventurous experience to do in Egypt. What is the Valley of the Nobles? The Valley of the Nobles (The Tombs of the Nobles or The Theban Necropolis or The Worker’s Village) is Hundreds of rock-cut tombs of nobles in ancient Egypt, discovered along the west bank of the Nile in the city of Luxor on an area called Sheik Abd El-Korna. It is located between the Ramesseum and Hatshepsut's temple, carved into the hillside to the final resting place to many governors, officials, administrators, generals and others from the new kingdom (1570-1070 BC). Valley of the Nobles were very humble and not large or extravagant like the tombs of the Kings. In these tombs, there are many simple depictions that painted a picture about life was like back then at ancient times. These tombs were said to have lost through time but about at least 415 Tombs were found to various characters holding priceless information. Who Were these Nobles? Each one of the tombs was able to convey the full life story of their inhabitants through the wonderful decorations on the tomb walls depicting every detail of their lives. One of the most famous tombs is the one belonging to Ra-Mose (Number 55) who was the Mayor of the Thebes during the End of Amenhotep III reign, his tomb consists of a rock-cut court with a central doorway leading to the inner hall and under it is shafts leading to the burial chambers where his mummy was not found and the decorations were not finished because Ra-Mose moved with the new King Akhenaton to the new Capital Akht-Aton (Tell El-Amarna) where his Tomb’s decoration was left unfinished, they were made using high techniques even if we couldn’t witness the final product. He was the High Preist of Amon, he enjoyed the Great power and had a unique position. His tombs shed some light on the period of Akhenaton calling for Atonism (The Worship of Aton the sun Disc) and on Akhenaton himself as a lot of information about his family and life was Known. Another example is the tomb of Re-Khmee-e (Number 100) who was the vizier of Thuthmosis III and Amenhotep II, that holds beautiful decorations that convey the arrival of foreign delegations carrying presents and tributes like agricultural products, utensils and rare animals to the pharaoh of Egypt. Through his tomb, we were able to determine the responsibilities of the vizier. The Tombs Chapel of Nakht (Number 52) belongs to a great Scribe and an astronomer in the temple of Amon during the reign of Pharaoh Tuthmosis IV while his wife was a chanter and carried many activities within Amon’s Temple. Their tomb was fairly small but it had beautiful decorations with brilliant colorful scenes. These decorations were able to convey many details about the ancient days and many of their customs like Bird hunting and the influence if the music in their Culture. The Tomb of Menna (Number 69) who was a land surveyor (A Tax Collector from the Farmers), is the most beautiful as it is filled with many decorations while a full day to day scenes of the ancient times which makes it completely magical. Make your dream come true and get the chance to visit the Valley of the Nobles through our cheap holidays to Egypt, or you can visit it with other historical landmarks that are excited in Luxor and Aswan with a private Egyptologist tour guide through our Nile cruises.